Four of the top five teams clashed this week, with Marown A making the trip down South from Crosby to take on Port St Mary A, which has been a happy hunting ground for Marown for a number of years. It wasn’t such a happy journey home this time, with Port St Mary A winning 7-3. For the home team Trevor Quayle, Paul Skelly, Ewan Cooil and Rob Cooil all had fairly comfortable wins, whilst Dan McCabe managed to get over the line 21-20, when it looked like defeat was certain. McCabe came back from a few points behind to defeat Paul Dunn. For the visitors Neil Withers and Colin Kelly won, with Matthew Keggen doing enough to win 21-19 over Juan Hargraves. League leaders South Ramsey A hosted Onchan A, with the home team keen to get over the disappointment of their first defeat of the season, whilst Onchan were looking to close the gap. The home team had other ideas taking a 9-1 victory over the visitors with David Bradford, Stefan Kelly and Alan Moore all winning to single figures, whilst John Kennish and Chas Grills also won comfortably. Peter Collister had to work hard to hold off Rob Monk, winning 21-17, whilst Glynn Hargraves saved game at 19-19 with Jordan Cain, and then won the next end to secure the victory 21-19. The lone winner for Onchan was Kevin Quirk, who inflicted a first league defeat of the season on Dido Kelly 21-13. Peel A held onto second place in the league, and extended the gap on the teams below them following a 9-1 home win against bottom of the table Douglas B, which could have been worse for the visitors with the home team missing out on a 10-0 maximum by a solitary point with Jimmy Samson defeating Gary Smith 21-20. Douglas A bounced back following last week’s loss to Onchan A, defeating visitors Castletown A 8-2, with Douglas only six chalks away from a 10-0 maximum, with two of the visiting players coming close to winning. Castletown B made the most of their home advantage over South Ramsey B, winning 8-2 and in doing so moved eight points clear of the relegation zone and closed the gap on the teams above them. Ballaugh A have now won four of their last five games over the teams closest to them in the table to pull even further clear of danger, following their 7-3 home win over Port Erin A. In the second division league leaders Onchan B took apart visitors Port St Mary B with a 9-1 victory, the only winner for the visitors was Ray Watterson winning 21-5 over Peter Wallis. Second placed Marown B came away from Mooragh Park, with a 6-4 victory over North Ramsey B to keep their promotion hopes alive. There is now a considerable gap developing between the top two and the rest. Jekyll and Hyde team Finch Hill A visited Noble’s A and had a good 8-2 win, whilst Port Erin B continue to impress, following their 7-3 home victory over Peel B.
Noble’s B had a tough looking trip to Port St Mary C, however they came away with a 7-3 victory, to keep in touch with the top two and stay ahead of their A Team. The bottom two teams Douglas C and Onchan C took each other on at the Villa, with the home team winning their first game of the season 8-2, to give them a massive boost, and in doing so the result lifted them off the foot of the table and above their opposition on the night. On Tuesday evening in the third division South Ramsey C had a good 7-3 home win over close rivals Peel C, to maintain their position at the top of the table, whilst Peel D took on South Ramsey D in the sunset city with Peel doing enough to take a 6-4 home win. Finch Hill B are still struggling to pick up the points, after the visit of Castletown C who came away with a 7-3 win, whilst Nobles C were at home to Ballaugh B, with the home team winning 7-3. Ballaugh C had a strong 9-1 home win over Douglas D, with Greg Brew being the only winner for the visitors. 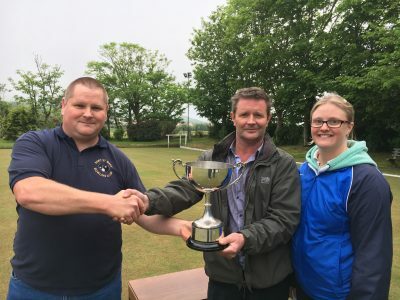 Port St Mary bowling club hosted the Port St Mary Cup mixed doubles, sponsored by Isle of Man Farmers on bank holiday Monday, with 31 pairs taking part in what started in very wet conditions and improved as the day went on. 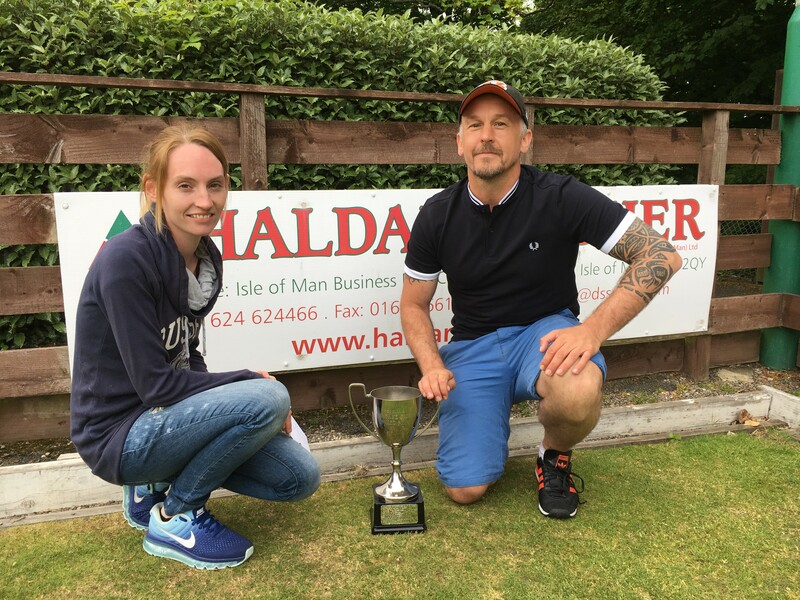 The eventual winners were Rebecca Teare (Nobles) and home greener Ewan Cooil, who sealed their first mixed doubles title together, defeating the Peel duo of Mary Moffatt and Dougie Allan in the final. The early exchanges were close, before Teare and Cooil built up a commanding lead which the Peel pair were never really able to close, with the eventual winners having a comfortable 21-13 win. Teare and Cooil came through their semi-final over the Husband and Wife pairing of Chris and Collin Holland, making short work with a 21-12 victory to book their place in the final. In the other semi-final Moffatt and Allan had to work a bit harder to get through, overcoming the challenge of Jenny Moore and James Teare 21-16, in a game that took 30 minutes longer than the other semi-final. Losing out at the quarter-final stage were Paula Firth and Jordan Cain, Phillipa and Alec Taylor, Margaret Tasker and Ken Karran, along with Val MacFarlane and Wayne Roberts. At the conclusion of play the presentation was made by Mike Caley of Isle of Man Farmers and club President Ken Karran, who thanked the sponsors for their support, the Ladies for the refreshments, everyone who helped throughout the day, and the green keeper for preparing the green, which held up well despite the conditions earlier in the day. It would appear that this Season is going to see a close battle for the League Champions go right to the end as we have regular changes in the lead. On Tuesday Castletown A hosted North Ramsey A and this was a 6-2 victory for Castletown with only Mike Skelly and Geoff Porter managing wins for the Northerners. 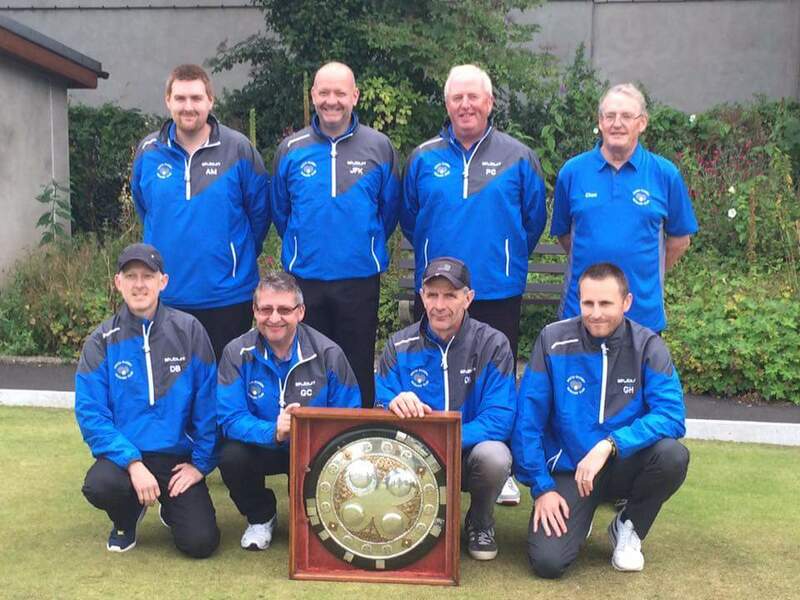 The Castletown B side travelled even further South to play Port St Mary A and this time it was a 6-2 defeat for the Castletown side with wins for them coming from Alan Phair and Terry Jackson. Onchan A welcomed Port Erin to the ‘Park’ and the Southerners came away with a hard earned draw while the Onchan B men travelled to North Ramsey B where they were beaten 6-2. Ballaugh B hosted Nobles A and this resulted in a 5-3 win for the strong Nobles side while the Ballaugh A side travelled to Crosby where they lost 5-3 to Marown. Douglas B lost 6-2 to South Ramsey at the Villa with Malcolm Black and Arthur Ashcroft getting wins for the Douglas men while the Douglas A lads played Peel Sunset B in sunny Peel and came back to Douglas with a 5-3 victory. Peel Sunset A travelled to play Nobles B and they brought an 8-0 win back to the West while Peel C lost 6-2 to Finch Hill. Onchan A travelled South to play Port St Mary B and like many other Clubs this season they found the Southerners hard to beat with the match resulting in a 4-4 draw. The Onchan B side hosted Ballaugh B and the home side eaned a 5-3 win at a sunny Onchan Park. Castletown A travelled to the ‘Villa’ to play Douglas A in a tight match which saw some close games but in the end resulted in a 5-3 win for the Castletown men. Castletown B hosted Peel Sunset C and the home side won 6-2 with the two wins for the Westerners coming from Michael Callin and Terry Crutchley. At the Mooragh Park North Ramsey A beat a strong Marown side 5-3 while the North Ramsey B lads packed their mules for the journey to South Ramsey in a match that resulted in a 5-3 win for the South Ramsey side. Peel Sunset A had a good 6-2 victory over Port St Mary A and Peel Sunset B also had a 6-2 win, this time away at Finch Hill with Bill Cairns and Eric Stanley being the two winners for Finch Hill. Port Erin beat Nobles B 6-2 on the Southerners Home Green and Douglas B travelled to play Ballaugh A where the away side lost 8-0. So after a week which saw two good wins for Castletown A and two draws for Onchan A we see the Southerners just edging back into the lead with Onchan A in second place although they are equal on points with a points total of twenty six. In third place are Nobles A with twenty four points and they are then followed by Peel Sunset A, Marown and Port St Mary A all on twenty two points. Although there is still a long way to go yet if this trend id followed throughout the Season it really is going to be ‘tough at the top’ this Year. 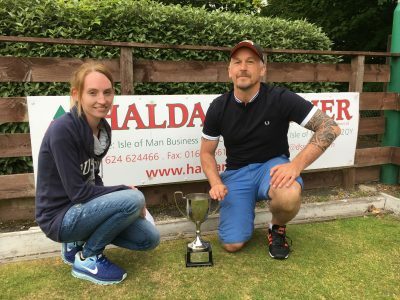 Douglas bowling club hosted the Haldane Fisher sponsored mixed doubles competition on Sunday with 32 pairs taking part. In a competition heavily involving South Ramsey players in the latter stages, the eventual winners were Jenny Moore and James Teare, who clinched their first mixed doubles title together, defeating club mates Elaine Moore and Glynn Hargraves in an entertaining final, with Jenny leading well at the front and James playing some great bowls at the back throughout the game. The final was nip and tuck early on with Moore and Teare eventually building up a 16-12 lead, before the score was pulled back to 17-16, with Moore and Hargraves lying one to potentially level things up. Teare played a great bowl to rest his opponents out for two and make the score 19-16. Next end Moore and Teare got the two chalks needed to secure a 21-16 win and they were understandably delighted when they finished the game off, with Hargraves going through the same gap twice. I am sure this will be the first of many for the pair, who have been close a number of times to picking up their first win together. Jenny and James got through their semi-final with a comfortable victory over home greeners Muriel Cain and Andy Cannell. In the other semi-final Elaine Moore and Glynn Hargraves ended the challenge of club mates Kim Hargraves and Stefan Kelly. Losing out at the quarter-final stage were Maureen and David Lacey, Margaret Tasker and Ken Karran, Alison Keggen and Wayne Roberts, along with Maureen Payne and Sid Bolton. At the conclusion of play the presentation was made by President Kay McKiernan and Norman Kneen, who thanked the sponsors for their continued support, everyone who helped through the day, commenting on the standard of play in an entertaining final. Unfortunately both Peel Sunset and Purt le Moirrey were a player short on Friday 19 May. Peel travelled to Castletown where a good win by Shirley Corrin saved their blushes while Purt le Moirrey did a little better on their visit to Mooragh Park, coming away with three winners in Tracy Moore, Chris Holland and Lesley Coker. South Ramsey were ruthless against Onchan, winning all nine games, six of them to single figures. The best result for Onchan was Wendy McDowell’s 14 against Kim Hargraves. Port St Mary had a strong result against Nobles, winning 6-3 with all nine players reaching double figures. The three winners for Nobles were Sylvia Kennaugh. Rebecca Teare and Paula Firth. It was hard fought at Marown where all but one player reached double figures, the home side taking the match 5-4, defeating Port Erin by just eight points, Barbara Graham won to single figures at Douglas, but it was not enough as Ballaugh lost 4-5 on games with two of the Douglas players also winning to single figures. In the Ellan Vannin Fuels sponsored first division South Ramsey A made the trip to Crosby on Monday night, with memories of last year’s 9-1 defeat fresh in their minds. They gave a much better account of themselves this time round, despite being beat 7-3 and losing the aggregate by only four chalks, they will feel it could have gone their way on another night. The first four games ended all square with Marown A captain Neil Withers taking the first win for his side with an assured 21-7 victory over Peter Collister, with Dido Kelly replying for the visitors with a 21-4 win over Phil Kelly. Matthew Keggen put the home team 2-1 ahead with a good 21-11 win over Alan Moore, shortly followed by Stefan Kelly levelling it up for the visitors with a 21-14 win over Bob Clark. In the second half of the match the rain came, with South Ramsey looking like they could take an 8-2 win at one point, the Crosby men dug deep to respond. The Islands most decorated players Colin Kelly & John Kennish were drawn to play each other, in a game that neither player could shake the other off, however it was Kelly getting over the line to win 21-18 and in doing so ending an incredible run of 49 consecutive wins in the league for Kennish. John Gelling took on Chas Grills, with Gelling also winning 21-18. Mark Moorley came back from 17-7 down to win 21-20 over Glynn Hargraves, which ultimately earned his team the aggregate victory. Last game off on what ended up an awful night was David Bradford, who earned his team an extra point winning 21-18 over Paul Dunn. Onchan A have been quietly plodding along this season, with a good 8-2 win over visitors Douglas A to close the gap to five points, this could have been even better with Rob Monk, just losing out 21-20 to Douglas captain Paul Kelly. Peel A currently sit second in the table, also five points behind South Ramsey by virtue of having played a game more than their rivals, took the trip down to Castletown to take on the B Team, coming away with a good 9-1 win. Port Erin A were unable to use their home advantage with North Ramsey A being pleased to take a 7-3 win. South Ramsey B & Ballaugh A continue to pull clear of the relegation battle with South Ramsey beating Castletown A 7-3, whilst Ballaugh beat Douglas B at the Villa 6-4. The battle to stay up is now looking like a three way fight between Castletown B, Port Erin A & Douglas B. In the second division Onchan B stayed top thanks to an excellent 9-1 away victory against Port St Mary C, whilst Marown B had a tough trip to take on Port St Mary B, winning 8-2 to stay in touch with Onchan B.
Nobles B continue to make life hard for Finch Hill A courtesy of a 9-1 win, whilst Nobles A stayed in touch with their B Team winning 7-3 away to Peel B. Port Erin B continue their rise up the table following a 9-1 away win against Onchan C, whilst Douglas C lost 7-3 at home to North Ramsey B. In the third division South Ramsey D had a good 8-2 home win over Ballaugh C, with Peel C matching their result with a home win over Marown C. Peel C now have a chance to put a bit of daylight between themselves & other teams at the top, as they have a game in hand on their rivals. Peel D carried on the run of 8-2 wins, following their visit to Douglas to take on Finch Hill B. South Ramsey C kept their promotion hopes alive with a 7-3 away win against Ballaugh B. Douglas D won 5-3 on games against Nobles C, but missed out on the aggregate by just one chalk. Onchan A go clear at the top. As we came to Game 12 of the 2017 Men’s Over 60’s Season it is becoming apparent that this will be an exciting year with a number of teams in contention for the League Title. Ballaugh A hosted Peel Sunset A and it was the home team who took the honours although a hard fought game between Barry McDonald and Peel’s Leslie Halsall which ended 21-19 to Barry could quite easily have gone either way. Castletown A beat Nobles B 7-1 at Castletown with the only winner for Nobles being Brian Atherton who beat Dave Hollingworth 21-18. Castletown’s B Team travelled to Nobles Park A and this time the honours went to the Douglas club who won 6-2. Douglas A travelled to the Mooragh Park to play North Ramsey A and in a match played in a really friendly atmosphere with lots of banter it was the Ramsey side who ran out 5-3 winners. After the match it was not the bowls that was the talking point but it was had Stuey Garrett eaten Norman Radcliffe’s scone with Mr Radcliffe feeling that Stuey was the prime suspect. Douglas B hosted the North Ramsey B Team and this time the result was a 4-4 draw in a close match at the Villa. Onchan B played against the Onchan A Team at the ‘Park’ and this although the A Team won 5-3 this could so easily have ended in a shock result as the B Teams Peter Wallis and Gary Lee both lost 21-19 to Mike Alexander and Bernie McPhee respectively. Peel Sunset B took a 5-3 win from Ballaugh B in a match that had some very close games and the the Peel Sunset C men played a strong Marown side with the latter taking an 8-0 win with Bert Quayle and Phil Clarke getting the nearest to 21 for the Peel side. Port St Mary B took their passports for the long journey to South Ramsey but the travel was not in vain as they came away with a 6-2 win with the winners for South Ramsey being Bill Callow and Chas Grills. Finch Hill hosted Port Erin in a match that ended in a 5-3 win for the Douglas side although there were a couple of close games. So after the completion of Game 12 we now have three teams level at the top on points, these being Castletown A, Nobles A and Onchan A who are all on 20 points and they are closely followed by Marown on 18 points in fourth place. Castletown A travelled to a ‘hard to beat’ Marown and the home side took a 5-3 victory from the southsiders with the Castletown B Team having a better day at home to Finch Hill in a game that saw the Castletown men running out as 5-3 winners. Port St Mary B hosted high flying Nobles A and again one of the top teams found the going tough as they were held to a draw by the home side and the Port St Mary A Team made the reverse journey to Nobles Park where they came away with a 5-3 victory. Douglas B made the journey to Ballaugh B and were beaten 5-3 by the home side in a match that saw a number of close matches and could have gone either way. The Ballaugh A side held Douglas A to a draw at the ‘Villa’, again in a match with close finishes. At the Mooragh Park North Ramsey B were beaten 7-1 by Onchan A with Bryan Corner being the only winner for the northern side and North Ramsey A travelled to Onchan Park where they came away with a 5-3 victory. In the ‘Sunset City’ Peel Sunset A beat South Ramsey 6-2 while the Peel Sunset C Team played their Game 13 match the following day at home to Port Erin with the southerners emerging as 5-3 victors. Top team Onchan A hosted Ballaugh B and despite a spirited effort by the boys from Ballaugh it was the Onchan team who eventually ran out 5-3 winners but it was not all joy for Onchan as Ballaugh A inflicted a similar 5-3 defeat on the Onchan B team back at Ballaugh. After a ‘blip’ last week when they lost to Marown the Castletown A side had an emphatic 8-0 win against Peel Sunset C while Castletown B travelled further south where they were held to a 4-4 draw at Port Erin. The forward surge of Marown was slowed a little as they were beaten 5-3 by Port St Mary A and the Port St Mary B men travelled to Finch Hill with the southerners getting a 5-3 win. Nobles A and Peel Sunset A battled to a draw at Nobles Park whilst back in the west Peel Sunset B and Nobles B also recorded a draw. 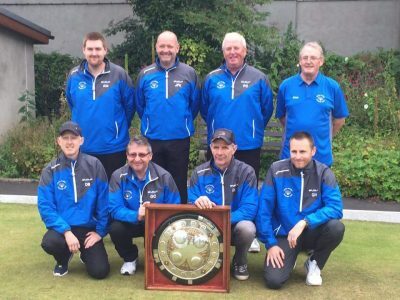 In the north of the Island North Ramsey A played their B Team and this resulted in a 7-1 win for North Ramsey A with their only loser being Norman Radcliffe who lost 21-10 to his fellow ex South Ramsey player Brian Stewart. South Ramsey hosted Douglas A and this match became the fourth draw of the day with a 4-4 scoreline. So after fourteen games have been played we have Onchan A clear at the top of the League with 22 points and they are closely followed by Castletown A and Nobles A both with 20 points. There were no very high scores in the C Tarleton Hodgson sponsored ladies’ league on Wednesday 17 May. In the top of the table clash at Castletown, the tricky green caught several of the Port St Mary players out, the home side winning 6-3 on games, although Ann Maddrell and Margaret Tasker almost added to the visitors’ games tally, reaching 19 and 20 points against Marie Ashurst and Ann Hollingworth respectively. Top scorers of the night were Mooragh Park on their visit to Onchan. The two winners for the home side were Marilyn Ellison and Sue Gawne, while five of the visiting side won to single figures.South Ramsey were successful on their journey south, winning 5-4 on games, but with four wins to single figures they had a good points advantage. Nobles also won 5-4 and despite Rosie Winckle’s win to single figures for Marown, the home side’s three wins to single figures gave them the match .The star game saw Shirley Whelan edge out Alison Keggen 21-20. Purt le Moirrey had the better of Douglas 6-3 with three wins to single figures. Two of Douglas’s wins, by Brenda Williams and Jan Osborne were also to single figures, but it was not enough. Ballaugh showed the advantage of fighting for every point as, despite losing 4-5 on games, they came through to win by 5 points. Twenty-two pairs assembled for the Ladies’ IOM doubles championship at Castletown on Sunday 21 May. Initially the weather was sunny but cold and clouded over mid-afternoon. However the latter stages of the event were played in beautiful, warm sunshine. The Castletown green was fast-running and its usual tricky self, but despite that there were some very close and exciting games. The outstanding player in the first few rounds was Rita Callister, showing that age is no handicap as she and her partner, Shelley Kennish, despatched Dot Mylchreest and Pauline Worrall 21-17, Maureen Payne and Chris Price 21-19 then Margaret Tasker and Tricia Bull 2!-20 before losing out in the semi-finals 21-20 to Ann Maddrell and Katy Williams, a game they were ahead in until the last four ends. Quarter-finals; Sheeley Kennish and Rita Callister 21, Margaret Tasker and Tricia Bull 2o; Katy Williams and Ann Maddrell 21, Lyn Bolton and Paula Garrett 17; Ann Hollingworth and Heike Perry 21, Kath Kinley and Marie Ashurst 17; Debbie Leece and Alison Keggen 21, Philippa Taylor and Joyce Ogden 12. In the first semi-final Rita and Shelley made the better start being 17-10 up after ten ends. Katy and Ann won five of the next six ends to level at 19-19, then the next end to reach “all but”. their opponents won the next end-20-20. It was all on the last end where Katy and Ann came through to win 21-20. In the other semi-final, Debbie Leece and Alison Keggen, who had played well all afternoon, kept level with Ann Hollingworth and Heike Perry for the first part of the game, but a 4 and a 3 in the last few ends saw the Castletown pair through to the final 21-13. The home pair shot off to a 15-10 lead before the Port St Mary girls won five of the next six ends to level at 16-16.Ann and Heike then got the jack back and won the next four ends to take the title 21-16. The Presentation was made by Association president, Rosie Winckle, who thanked Castletown for the use of their green and their help in measuring, marking etc. She also complimented them on the state of the green. Thanks also went to Heather for running the sheet and Elaine for organising the competition.